Society is badly served by the limited set of ideas which occupy our cultural mainstream. To cope with the increasing pace of change, we need big new ideas. Where might these ideas come from? In this London Futurists presentation, Jamie Bartlett, Director of the Centre for the Analysis of Social Media at the think tank Demos, shared his thoughts on a number of “radical” outsiders — a variety of individuals, groups and movements who reject the way we live now, and who are attempting to find alternatives. Drawing on material from his recent book, “Radicals: Outsiders changing the world”, the talk gives particular attention to: Zoltan Istvan, Transhumanist Party candidate for the US President; Tommy Robinson of Pegida UK; and and Vít Jedlička, the founder of the self-declared libertarian micronation Liberland. The event was chaired by David Wood. The camera was operated by Kiran Manam. For more details about this event, see https://www.meetup.com/London-Futurists/events/238148196/. 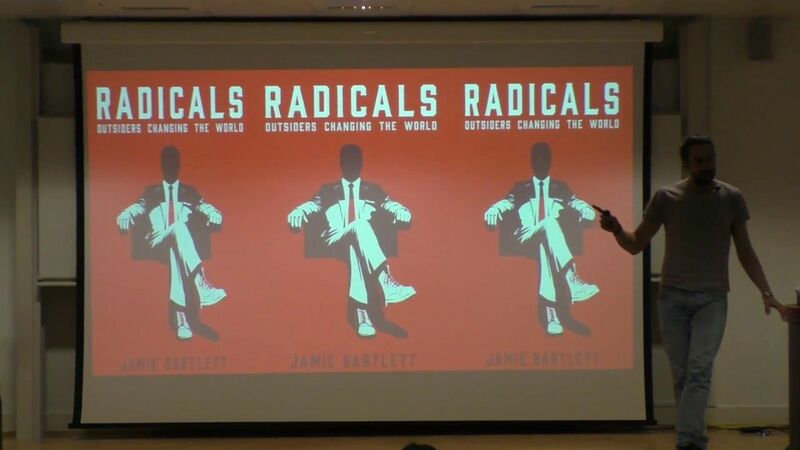 For more details about the speaker’s book, see https://www.amazon.co.uk/Radicals-Jamie-Bartlett-ebook/dp/B01K6ROZPC. These are some of my thougts regarding the future. This is from my forum which started in 1997 and was online for 10 years. The incentive to be a member in good standing in society is the pursuit of immortality. Humankind’s social activity, ultimately its urge to mate, is an instinct, just like the instinct to live. If the purpose of society is to protect and enhance the wellbeing of its members, then providing the means to achieve immortality should be one of its highest priorities. The “New World” must provide individuals with access to the experts, the education and the means to achieve immortality.